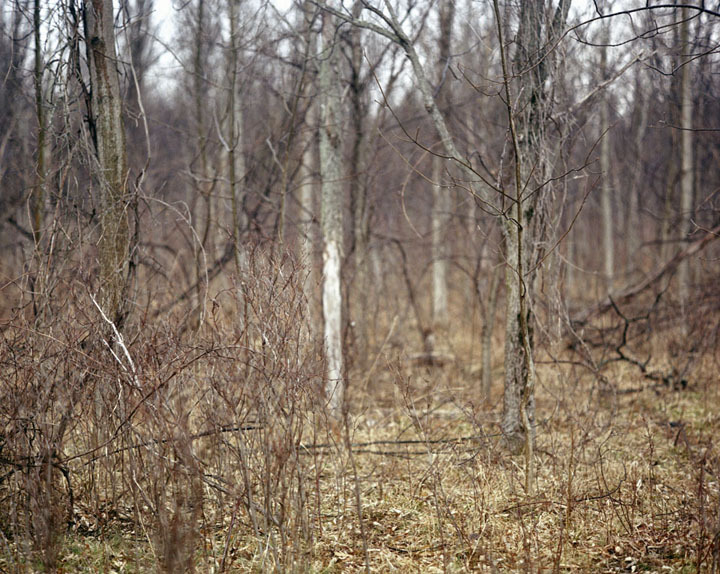 Mericle’s narrative of the white herd of deer in the Seneca Army Depot of Central New York State presents an ecological paradox; a story about restoration and hope. As part of the back story, the Seneca Army Depot is a major environmental pollution site resulting from the disposal of weapons and military waste over the many years of the Depots existence. As a result of the limited public access to areas within this site, it now provides a sanctuary for one of the largest herds of a rare white deer. 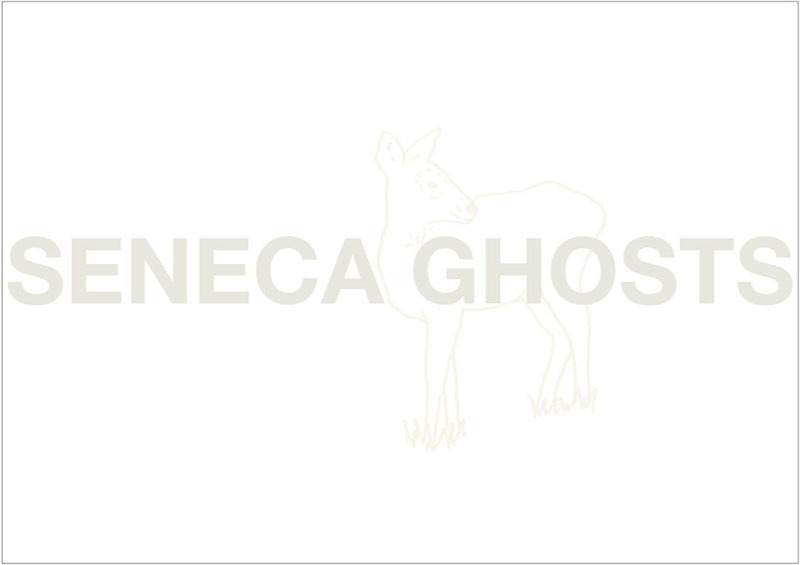 This paradox is investigated by her photobook Seneca Ghosts. Mercile provides hints, indications and fleeting glimpses of these weary animals as they transverse this rugged landscape. Similar to the photographic practice of Bernd and Hilla Becher, she has chosen the early winter period to conduct her investigation, where the heavy foliage from the trees has dropped, but yet the winter snow has not blanked the ground. This is a time in which you can peek further into the landscape with the contrast of the white deer against the gray foliage and brown terrain has the largest amount of contrast. 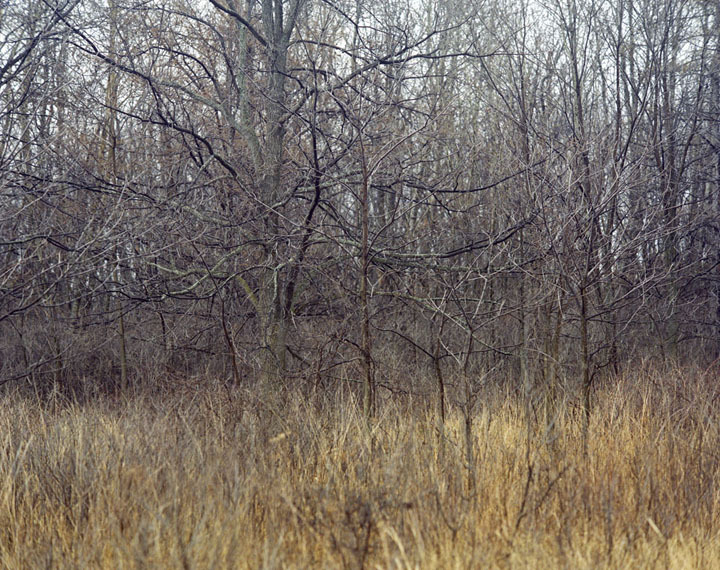 Perhaps ghost like, the presence of something amongst the trees and brush is almost palpable. The clues provide the necessary hints; there beaten down deer runs, tree bark chewed away and grassy areas showing signs of grazing. When observed, it appears that the white deer’s presence is fleeting, usually of something blurring into the distance. Where I grew up in Southern Michigan and Western Pennsylvania there are many wooden regions similar in appearance to the Seneca Army Depot of Central New York state. These three regions are “similar in appearance” by the commonality of the relatively flat terrain, variety of trees, brush, and weeds and it would be very difficult to differentiate between them. 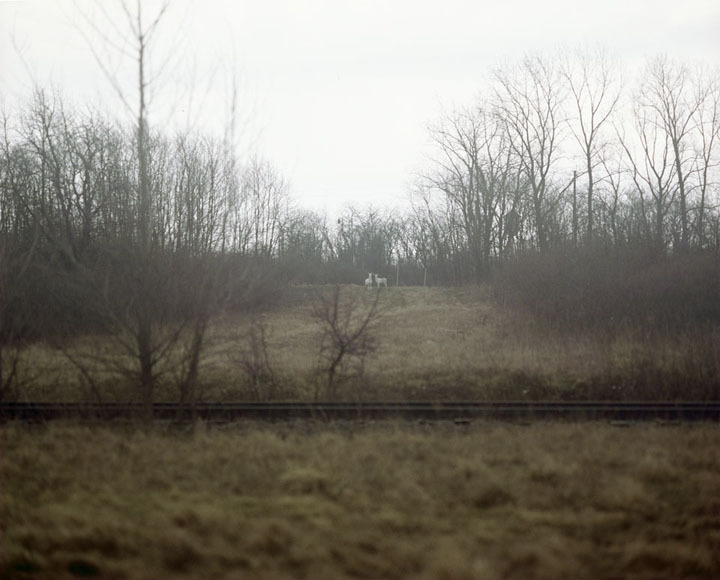 Nevertheless, Mericle’s photographic style that interprets many of the places within the Seneca Army Depot only faintly resembles my memories of these places. 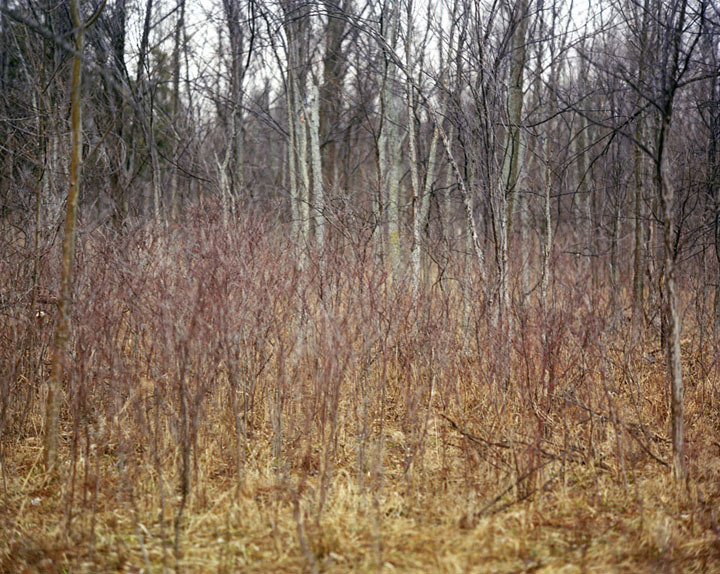 In part Mericle’s landscapes photographs create an abstraction of nature, which lies within the prowess of the photographic medium, in which a long lens compresses and flattens space and a wide open aperture provides a thin slice of a precisely focused subject. I could not visually experience this place and have similar impressions without the benefit of a camera or other visual aid. Her landscape photographs create a lacy haze of delicate branches and limbs that overlap each other in a slightly crazy and complex kaleidoscope of lines and texture, which are exotically beautiful. Her photographs remind me of the dripped action paintings of Jackson Pollock, the Abstract Expressionist painter whose own studio was in a similar region of New York State. Lurking in the edges of her photographs, occasionally as a backdrop, are the historical artifacts of this mysterious and abandoned place; artificial mounds grassed over, topped with rusting ventilation towers. The manmade structures are gradually becoming overrun by nature, with the steady encroachment of trees, brush and weeds. The steady reclamation of nature then provides the necessary food and shelter for the animals, birds and other wildlife of this region, especially for this herd of white deer. The concern is that the natural restoration is a very artificial condition and due to the nature of the environmental pollution present. This is also a narrative about adaptation and endurance of nature, that if provided an opportunity, a rebirth is possible, thus a narrative about hope. The book has stiff covers and is perfect bound, illustrated with color plates. The full bleed photographs imply that we are glimpsing but a small part of this region that the space is more expansive than the photographs on the small pages portray.